Kaltura, a leader in video streaming services provider around the world, has now collaborated with Stripe, a software platform which helps businesses to securely accept payments online through mobile apps and also through other payment alternatives like Android pay and Apple pay in over 130 currencies. Kaltura Video Streaming services has more than 9 million active TV subscribers at present. Kaltura is a global leader in providing video based solutions and media streaming services. Majorly operating in four major markets i.e. Cloud TV, OVP(Online Video Platform), EdVP(Education Video Platform) and EVP(Enterprise Video Platform), it’s presence has been widespread all across the globe. A recognized leader in providing the OTT (Over the Top) content, it is also a major provider of video streaming services globally to thousands of organizations, media companies and educational institutions. With that it has been successful to engage millions of viewers at home, work and at educational institutes. Collaborating with Stripe simply means that major OTT providers like Netflix, YouTube etc. can make their checkout process using Kaltura Platform much simpler and efficient for users and therefore can increase their revenues to a large extent. Using Kaltura OTT TV, from now onwards, any media company or broadcaster can charge customers directly by relying on different business models like ad-based, subscriptions, one-time transactions, coupons etc. OTT providers will also be able to check fraud and could comparatively scale faster than ever. Users can combine Stripe with other billing services i.e. invoice-generation through app stores and home-grown billing systems. Kaltura OTT TV will now allow users to add additional payment options like home-grown systems etc. and that will make it convenient for broadcasters and service providers to use Kaltura as a platform to sell their stuff online. This could be easily deciphered that relying on Multiple Revenue Streams can make OTT services more profitable and sustainable at the same time. 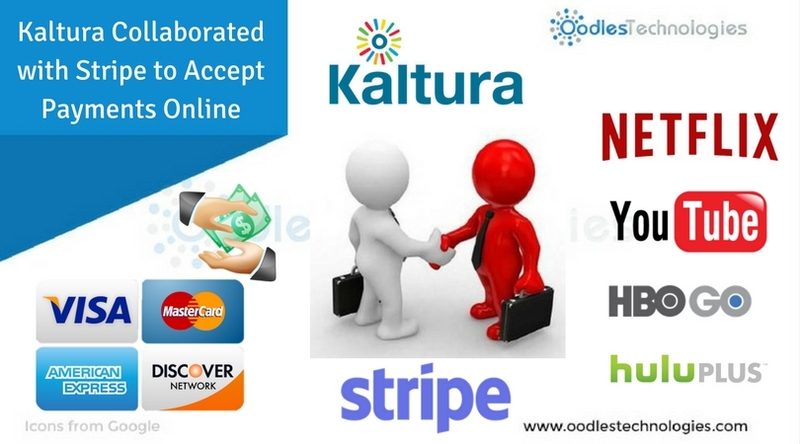 Stripe clearly stated in a statement that it is more than happy to be associated with Kaltura and pointed out that with their integration with Kaltura, OTT providers will now be able to offer their customers a more secure and safe checkout option on any device. The customers will also be having access to a bouquet of tools available to them which includes a Card Updater which can update an expired credit card and a few very advanced fraud protection tools. With other video streaming providers in contention like Amazon Fire TV and Apple TV, Kaltura is trying its level best to keep up with the game and provide its userbase an enriching experience in video based solutions with an unparalleled convenience in bill payments. Kaltura Live Streaming Services are also popular among the universal folks which adds to its revenue collection in total.